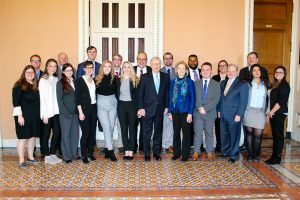 Asbury Spends the Week in D.C.
At Asbury University, students are encouraged to start here and impact the world. That’s why each year Dr. Steve Clements, chair of the Social Science & History Department, brings a group of eager-to-learn Asburians to Washington, D.C. to explore the nation’s capital city, discuss policy and meet with a variety of high-profile politicians, leaders and world-changers while attending the National Association of Evangelicals (NAE) Christian Student Leadership Conference (CSLC). Asbury University President Dr. Sandra C. Gray is also in D.C. this week, attending the 2019 Council for Christian Colleges & Universities (CCCU) Presidents Conference and joining Asbury students for several activities, including a few congressional visits and a trip to see several local alumni. Students were particularly excited about meeting with Congressman Brett Guthrie and Asbury alumnus Congressman Jody Hice ‘82. In addition to congressional visits, the Washington Federal Seminar class joined thousands of other students from Christian colleges and universities in attending sessions at the CSLC. Session topics included Evangelical Political Engagement, Creation Care, Immigration, Faith in Public Life and more. Senators Mitt Romney and Ted Cruz as well as Speaker Nancy Pelosi were among the session speakers. International student Angie Flores ’19 wanted to take part in the week’s events so that she could learn more about the U.S. political system and the ways in which it directly affects other countries, including her home country of Honduras. Dr. Gray with alumna Emily Louden ’14. Flores was especially heartened by the space she was given to ask questions and really dig deep into certain topics with those who are working right in the middle of it all. She also took a very key universal lesson away from the week — one that she can use in her own future career in the medical field. Bible and Theology major Kyle Pernell ‘22, who decided to attend the conference to find the essential connection between the pulpit and the political realm, encourages students to consider applying for the Washington Federal Seminar in future years. “Come! You have the key to open opportunities, pursue power, create change and secure success, but the door is here,” Pernell said. 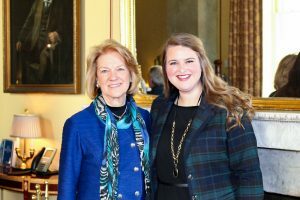 Journalism major Annie Brown ’21 pictures a life and career on the Hill and enjoyed getting to see what that life could actually look like during her week in D.C. She also appreciated the opportunity to speak with several congressman and senators. Learn more about Political Science at Asbury.